In this combined feature of Jesus, Our Savior Parts 1 and 2, we are introduced to the most sinister, most evil villain, Primordious Drool. Drool knows he cannot win against Bibleman on is own and has a plan to fight our favorite superhero. He intends to make Bibleman fight against himself. Drool drives the citizens of Andersonville to trust in Bibleman instead of God. Bibleman faces is touhgest challenge ever as he has to explain to the townspeople that they cannot look to him as a superhero to save them. They must look to God, for only God can answer their prayers. Bibleman's only chance for survival rests on the shoulders of his two most trusted allies: Cypher and Biblegirl. Only by joining together can they defend the city from Drool's evil plot and defeat his wicked scheme to turn every believer from their faith. Our Bibleteam must rely on their faith in Jesus to overcome the ultimate battle of good against evil. 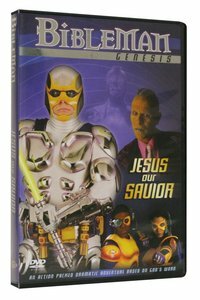 About "Jesus Our Savior (Bibleman Genesis Series)"